Tissues are an absolute necessity in every household. Why not give your tissue boxes a little flair with a new wooden tissue box cover? This is the perfect way to accent your decor or add some personality to a room. These tissue boxes are cut & made from 1/8" solid cherry or birch wood right here in the USA. They are fit together by interlocking finger joints, which results in a modern square patern along the edges of the tissue box cover itself. An oval is cut out of the top in order to easily pull your tissues out. Just slip your cover on and off your tissue box with ease (the isn't a bottom). They measure at approximately 5"W x 5.5"H x 5"D and should fit over a typical square tissue box. 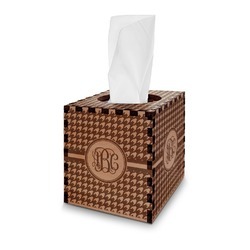 Your very own design is laser engraved into each side of the tissue box cover. Laser engraving is done with shades of grey - black is the darkest, while white does not engrave. Colors in between will engrave as shades of grey. Choose your favorite pattern, ribbon, graphic, text, and more. Create the perfect design in our design center. Have fun creating and contact us if you need any help. Not quite what you were looking for? We also have a color tissue box cover as well! You'll find much more home decor in our Bedroom, Bathroom, Kitchen sections, and more. We have everything you would want to get personalized from curtains to bed sets.